Home » Reading » Bout of Books 20 SIGN UP! Bout of Books 20 SIGN UP! It’s that time of year again! Bout of Books is back. 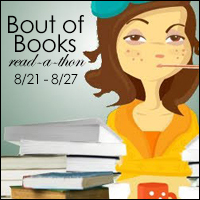 I’ll be participating in my third Bout of Books Read-a-thon from August 21 to August 27. Do you want to challenge yourself to read more than you usually do? Sign up for Bout of Books too. The lovely part of this read-a-thon is that it is low pressure – there are no rules to follow or book/page counts to achieve. And, the community who participates are incredibly nice. My Goal: read more than I usually do during a usual week (which means no more Toy Blast – a ridiculously addictive mobile phone game…I’m on Level 580…). I’ll post updates on my reading progress on Twitter with #BoutofBooks. Stay tuned for my TBR post later this week and some read-a-thon challenge posts next week.